If you've never walked down a country road on a winter night, when the moon is full and casting a pale blue light that reflects off the brilliant white snow drifts, then you may not be able to fully appreciate this song. We used to live just down the road from my parents, and often I would walk over for a visit in the evening. The sun goes down very early in the winter, so I was usually walking home in the dark. But one night as I walked home, the moon was particularly bright. Being out in the country, there were no other neighbours, so the only other light was the one in the distance, that my husband had left on for me. And there wasn't a sound other than the snow crunching under my feet....no cars, no animals, and no voices...except the voice of my Lord speaking to my heart. Everything around me was covered by glistening white snow, and any dirt or imperfections that would have been obvious during the day were invisible to my eye; everything appeared pristine in the pale moonlight. As I looked up at the sky and praised the Lord for his wondrous creation, my heart was filled with awe, and I marvelled that this God who had created all cared about me. 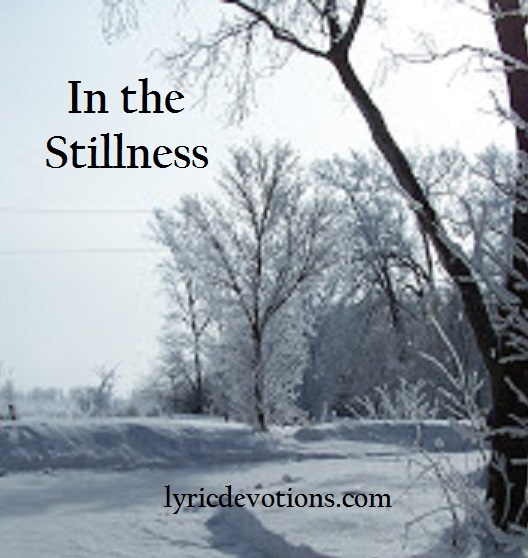 In the stillness of that winter night I pondered God's love for me. and sense my Saviour's presence there. A pure white blanket covers the ground. God's wondrous creation all a round. a glimpse of his glory and majesty. my path ahead appears clear and bright. and know a peace beyond compare. proclaiming his presence all around. the wonders my Lord has revealed to me? In the stillness I ponder God's love for me. The creator of all came to set me free. for the one who died to take my sin. giving thanks for God's amazing grace! Psalm 8: 3-4 When I consider thy heavens, the work of thy fingers, the moon and the stars, which thou hast ordained; what is man that thou art mindful of him? and the son of man, that thou visitest him?